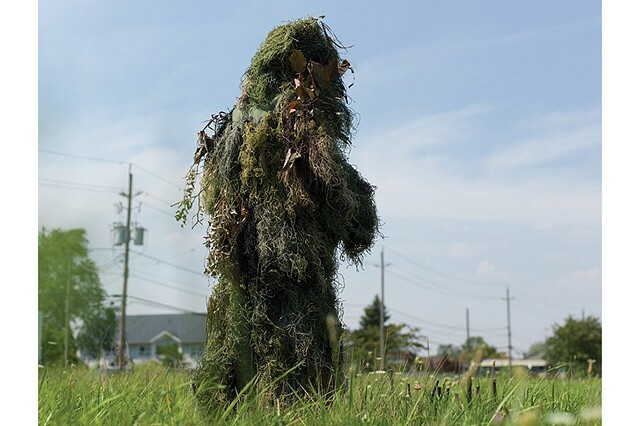 In Forms of Awareness: Ghillie Suit, military camouflage is re-positioned in the open air of suburban neighbourhoods. Through a series of "un-camouflagings" Ghillie appears in various green spaces such as green zones, naturalized areas, trails and spaces slated for suburban development. Though she inspires a range of reactions, she often remains unseen. In Scottish Gaelic, the term Ghillie was often used to describe a servant or lad. Often assumed to be male, Ghillie recalls many human/plant hybrid creatures and monsters such as swamp thing or nature spirits that can be found across cultures including Scottish Ghillie Dhu, a wild but gentle spirit of the woods. Born in Windsor, Ghille may serve as a foreboding or protective guardian figure. Photos by Bree Arbor and Arturo Herrera.